There are so many stories from the Great Depression of what people did to feed their families and survive. 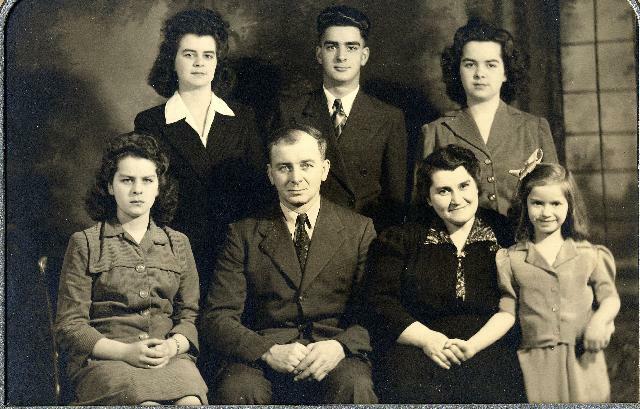 My family has many of them, from my paternal grandfather who supported multiple families with his paycheck to my maternal great-uncle (below, with his wife and children, my mother’s cousins). My great-uncle had a hard life. He walked out of my grandmother’s life when he was sixteen and she was not even six years old. Their mother had just remarried and the stepfather was clear that the children were unwanted. In a few short years, an older sister would be raped by the man and their mother murdered (unless you prefer the official story – she died when she somehow impaled herself on a pitchfork while alone in the barn with her husband). Within hours, the children were scattered as neighbors feared for their safety. Years later, my great uncle was working on high power lines for the electric company when the lines surged. He knew at that instant that something bad happened. His youngest brother, who was working on a different set of power lines that day, had been accidentally electrocuted. My great uncle blamed himself for getting his younger brother the job that resulted in his death. During the depression, my great uncle did whatever it took to keep his family fed. He took his gun with him everywhere he went. He’d shoot it and my great aunt would cook it. I don’t think that racoon or opposum sound edible at all, but I wasn’t hungry and trying to survive. The family stories say that my aunt made the best of the situation and used whatever she could scrounge to fill everyone’s bellies until times got better. My grandmother was a firm believer in family and in staying in touch. I remember visiting him, but don’t remember him saying much. You’d have never known he was a man who did what was needed and provided for his family in whatever way he could. Word for tomorrow – SOLID. If you prefer to work ahead, see the list for the week under “A Word A Day”. Wow, a lot of tragedy. I love family history. It’s fascinating to learn about the people who are responsible for our existence.